The National Association of European Trainers from Moldova recently launched the methodological support manual for teachers and trainers of Romanian Language “We interact and communicate”. 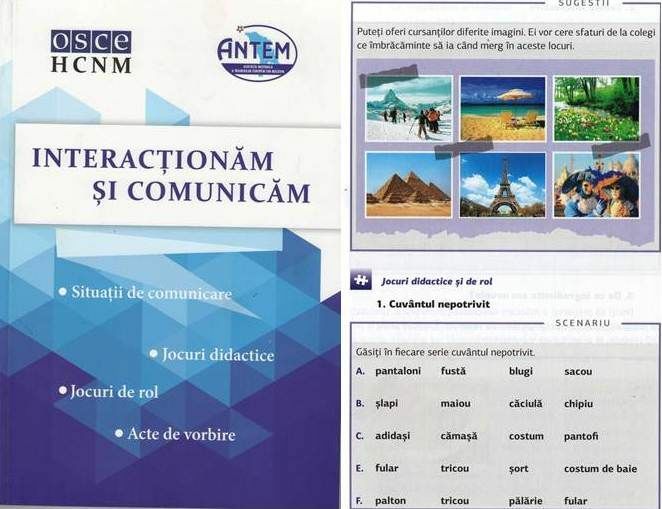 The work completes a range of teaching materials published so far by ANTEM, in order to facilitate learning Romanian language by non-native adults. The teacher support “We interact and communicate” contains 15 themes that include one word banc, joints and phrases, synonyms and antonymic couples, four communication situations, but also more educational games and role playing. A special chapter entitled “Speech Acts” proposes a number of expression formulas necessary for a desktop user. The manual focus is on modern approaches that involve interaction, a greater degree of involvement, creativity and flexibility. This aims to give the teacher or trainer wider freedom to exercise not only the role of transmitter of information but also an animator, trainer, facilitator or instructor. The work is a continuation of the set of manuals “Language that unites us”, aimed at learning with the teacher from A1 to B2 level, as well as the set “Communicating without barriers” for professionals from many fields who possess knowledge of C1 level. Everybody interested in the manual “We interact and communicate” could request it.